This incredibly effective water-based protector for carpet and textiles with built-in acid dye blockers and anti-static technology repels both oil and water-based soils. It’s 1-6 dilution ratio is one of the most concentrated in the industry! 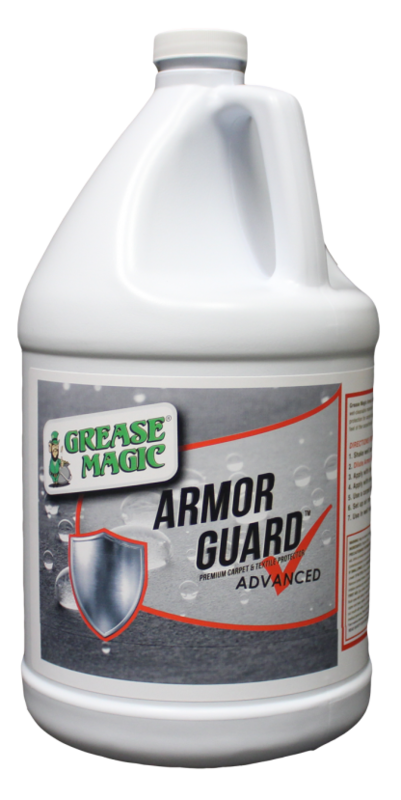 Armor Guard from Grease Magic is a premium water-based protector for use on wet-cleanable carpets and textiles. Armor Guard offers the highest level of protection against spills, spots, stains, and soiling on both residential and commercial carpets, fabric, and textiles. This highly concentrated protector is super cost effective, allowing you to protect 1400 square feet of carpeting for as low as 3 cents/square foot! Armor Guard’s dilution ratio is one of the most concentrated in the industry—one gallon of concentrated Armor Guard makes seven gallons of RTU product! Armor Guard features built-in acid dye blockers to repel even the toughest dye-based stains like Kool-Aid, juice drinks, cough syrup, popsicles, and more! Built-in anti-static properties prevent static build-up when protecting large areas of carpet and textiles in areas such as offices, cubicles, and other areas with heavy electrical currant. The best part? Armor Guard leaves the feel of the carpet completely soft and intact! Shake well before using. Always pre-test. Dilute Armor Guard 6:1 (21 oz. or 2.5 cups/gallon of water). Apply with injection sprayer on low pressure, or trigger sprayer. Apply with overlapping motions while keeping sprayer 12-18” from material. Use a carpet brush, groomer, or towel to distribute product into fibers. Set up air movement to speed drying process. Use in a well-ventilated area. Do not mix with any other chemicals. View Armor Guard SDS here. Use as a spotter on carpet?give it out to your customers so they can quickly and easily remove small stains on carpet and textiles!